Hello, this is about my suggestion for Rank Upgrades. Right now I have the Gold rank and I want to buy the Diamond rank but it costs to much for me and I think rank upgrades are the thing to do.. The idea is to "Upgrade" your rank, it still costs money but a little less than the next rank. So from Gold to Diamond then from Diamond to Emerald and so on. I think alot of people would like this. It is still just an idea from me so I expect it to not to work out. This has been brought up before and I think from what I remember the problem with that is a big part of ranks are kits. With the upgrade system implemented (assuming we made the upgrade cost equal to the difference between the two prices), it would cost $150 to get the same amount of items. And this is just counting the 3 main ore blocks. This isn't including all of the items that are included within the kits along with the 3 main ore blocks. This would virtually decrease the server's funds by a half, which isn't possible. It costs a lot to run the server and website. It's not a cheap thing, so halving the server's funds just wouldn't be possible. So someone is offering you real money for fake internet merchandise, and your answer is that you cannot give a discount on virtual items that literally cost nothing to the owner to make. Sometimes you guys surprise me with how terrible you are at running a business. You treat items in the game as if they have some sort of manufacturing cost. You would not be reducing the servers funds at all because you are assuming that you are guaranteed a sale. The most likely scenario is that instead of paying an upgrade price for a rank, the player will just not pay anything. If you are actually seriously concerned with imaginary items in a game, then you should make an upgrade kit or something and quit trying to take advantage of small children. Let me try to address your points. It's true that we have no variable costs (producing 2 units of donor ranks is the same as 4 units). However, we do have fixed costs in the form of the server, website, and other services. If we don't pay for these, we cannot provide ranks. So look at the graph below. As shown, our fixed costs are just constant (obviously). Our average fixed costs decrease as we sell more units. Say right now we are at P1 (current prices) and we're producing the quantity at Q1. 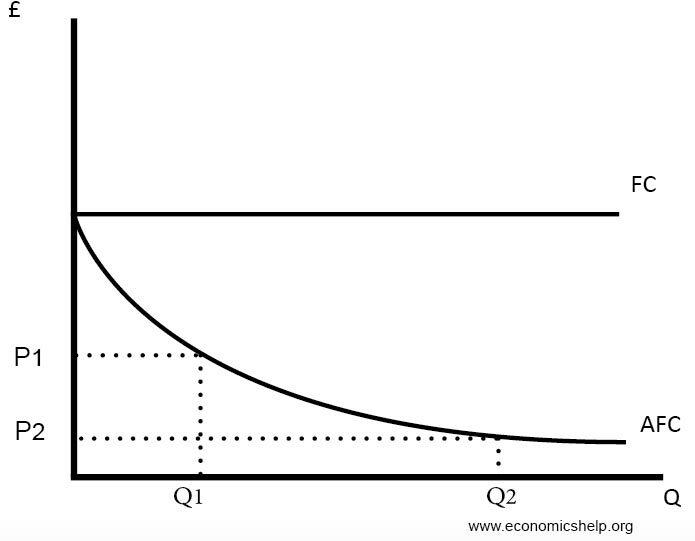 You're suggesting we lower the prices to P2 to get a few more sales, but that involves a huge assumption that quantity sold will greatly increase to Q2. If it doesn't, then it doesn't make economic sense to do that. You're also assuming that the demand for donor ranks is relatively elastic (a decline in price will result in many more sales and higher revenue) or unit elastic, but I disagree. I would say donor rank demand is somewhat inelastic. But we would have to have a lot more sales to justify implementing a program like that, not just a few more. Yes, it may be true that we lose a few sales from people who don't want to buy another rank due to lack of an upgrade option, but those few cases are far outweighed by normal sales at current prices. If prices were lowered to get just a few more sales, we'd be operating at a loss and the server would need to close down in the long run. This doesn't even consider the fact that the way the kits are designed is they include the previous kit plus some extras. So the Diamond kit includes the Gold kit plus the extra stuff for Diamond. If someone pays $10 for Gold and another $10 for Diamond, they're effectively getting the Gold items twice for the same price as the Diamond rank, which currently gives you just one set of the Gold items. It would not be fair to all those who paid for Diamond rank and got that kit. To the original poster: I'm sorry that I cannot offer you an upgrade option, but we have time and time again said this is not a fair thing to implement. It's not fair for you to pay $20 to get Gold and Diamond kits when the majority of our players paid $20 for just a Diamond kit and had to pay an extra $10 to get a Gold kit. I hope that makes sense, but if I can clarify anything, please let me know. To the original poster: save your money, unless something has changed very recently, /togglechop doesn't work, so the Diamond rank has almost no value. I honestly agree with Anthony and Isaac. I bought 3 ranks over the course of my play time, in quick succession. I bought Gold, Emerald and Elite. In total I paid $140 USD ($60 off elite due to a sale). If we had the system suggested, I would have only paid $90. These ranks yes they are only online things and cost nothing to make, but the server as Anthony said has fixed prices on other things like the server and this enjin. When I in my personal time looked up the costs from our server host, it isn't cheap. Yes, making the prices snowball might make more sales, but how many? Think back to 1.12 when the server almost went offline, if the prices were flow on, we probably wouldn't have saved the server. You also need to raise the issue of, the ranks are automated on enjin, HOW does enjin know what rank you already have? It does not to my knowledge, meaning someone could cheat the system or lose out. That needs to be considered. Alright I didn't think this would get this many responses. Thank you all for the responces you gave me.